I decided to start walking along the road and I soon found out that the mosquitos weren�t vegetarians in this area. In other words: they loved me. And it was scary. I don�t mind mossies around me, but they shouldn�t bite be, because then I get nasty! And let me tell you: there would be 6 of them sitting on my arm and when I wiped them away, there were 12 on my other arm. They were on my face, in my neck, on my legs and I just started running because this wasn�t funny anymore. When I woke up in my room of the Santa Catalina Motel I discovered three rolls of bread on and orange juice in the fridge. After this breakfast and after packing my bags again, I went to see Penny again. She had already started her business and sincerely apologized for her blackout last night. I had to laugh about it as it was quite funny. Anyway, this morning I would be picked up by a lady named Pip, who works for the Moonshadow cruise company and who�d take me up to the harbour of Port Stephens. I said goodbye to Penny and thanked her for the wines and letting me stay in her motel for free and ten minutes later I was standing on board of this huge catamaran that was going to take 99 Japanese tourists and me for a dolphin-watch cruise in the bay. For just over two hours the boat ride the waves of the bay entrance and surfed over the shallow waters where dolphins feed themselves. It took quite a while, but the Japanese society on board was thrilled when one dolphin was spotted. Of course, if the boat would be there a couple hours later, we might have seen twenty different dolphins, but we had to deal with this (much photographed by Sony�s and Nikons) one dolphin. That's nature. I was also enjoying the Japanese tourist on the boat, next to the great wide scenery over the bay. It�s like they had never seen a fish before, th�t crazy they started to be when the captain first spotted the dolphin. After a little hour the back-side net was lowered into the water and people were invited to go for a safe swim in the water. Of course I was the only one actually going in there (much photographed by Sony�s and Nikons) and it was great fun! It actually becomes very hard to hang in there when the captain comes with the idea of playing around with me in that little net and accelerates the speed of the boat�. At 12.30 I walked from the harbour through Nelson Bay, where I had to wait for the 2.20pm but that would take me to the Pacific Highway near a town called Raymond Terrace. While I waited on a bench, I worked on my hitchhike sign as I was going to travel to Port Macquarie from Raymond Terrace. There was a lady sitting next to me and her mouth fell wide open as those people passed by and recognized my backpack and me from the media. The logo of my website is of course pretty visible too. Cars passed by; with people in it saying they weren�t going that far, but they wished me good luck. On the other side of my carton sign I wrote �I don�t kill�, to go against the frightened Australians who don�t like to pick up hitchhikers after so many horror stories made the front page of all newspapers. Sitting there with that sign made some people laugh out loud as they were driving by, others put their thumbs up. It looks that they Australians are in for a joke! How entertaining while waiting for the bus! At 2.20 a bus from the Port Stephens Coach Company picked me up. It was already arranged by my hostess Penny Tonkin to get on the cruise and have this bus ride offered for free. What I didn�t know was that I was on a full school bus with high school kids who were being dropped off at home. And that was awkward! I was suddenly in their little worlds of deep conversations about gravity and why the world is flat, followed entire kids-fights were shoes are pulled off and bags are thrown through the bus, while the driver with a big hat on was telling me that I should be very important by getting a free ride to Raymond Terrace. The driver dropped me off near the onramp of the Pacific Highway after he had dropped of most of his load and I started hitching up north. 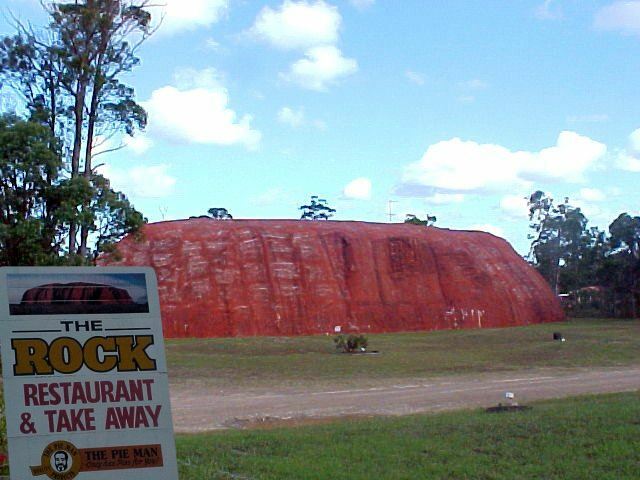 It was very easy, within fifteen minutes I had a lift from Mike, who took me along an oyster farm and showed me miniature Ayers Rock (a road restaurant). He dropped me off again near a place called Taree, where the traffic was minimal. I decided to start walking along the road and I soon found out that the mosquitos weren�t vegetarians in this area. In other words: they loved me. And it was scary. I don�t mind mossies around me, but they shouldn�t bite be, because then I get nasty! And let me tell you: there would be 6 of them sitting on my arm and when I wiped them away, there were 12 on my other arm. They were on my face, in my neck, on my legs and I just started running because this wasn�t funny anymore. At a parking spot, I threw down my backpack and dove inside it to find my anti-insect deet that I still have with me since South Africa. While sitting next to the highway I overdosed my body with this anti-stuff and I soon realized that I was mossie-free. I caught my breath and got hitching again. I probably must have looked awful. But when I was standing there and looked in the other direction I saw this guy stand in the middle of the road, some one kilometre away from me. He was whistling and waving to me! I grabbed my stuff again and started running to catch this ride. Totally out of breathe and sweaty again (remember, it still was around 30 degrees now), I reached the guy who first offered me a beer and then packed my backpack in the booth. His name was Wayne. Inside the car I met up with his wife, the driver and a little girl sitting in the back. Wayne talked about country life and I assumed he works as a farmer. �Have you seen any kangaroos yet?� he asked me. �A few,� I answered. �I possibly shot more kangaroos in my life than YOU would ever see in Australia,� he said and laughed out loud. He opened another beer. With [url=www.nellyfurtado.com]Nelly Furtado being played on the radio I suddenly got back to the civilized world, as far that was possible in that car. It�s amazing how a mossie walk along the highway can teach how nature can be from one second to another. There you are and there you will be eaten. The car passed some towns and the only thing I could think at that moment was a good hot shower. I was dropped off in North Haven, a small retired people village along the Ocean Drive, miles off the Pacific Highway. From here it was only another 30 km to Port Macquairie and as it was getting Friday night it would be easy to get a ride, Wayne told me. I put on a smile, I wasn�t denying it. �Do you want to stay with us?� he asked me. Wayne was really fascinated and called out he just had a celebrity in his car. I waved to them as they drove on to their nearby home. There I was. The sun was on its way to Europe and the clock said 7pm. It was getting dark and it became 8pm. I was giving up hope, as there wasn�t any real traffic at all along this road. But always, when I think that, I get picked up. This time there was a man who said he reminded my face from something. On the road to Port I asked if it might have been from TV. �You aren�t that bloke that is travelling through Australia, huh? That freeloader?� he asked. Yes I am. And yet another person was delighted to have me in the car. After the most frequent asked questions about my life and way of living, he dropped me off in the centre of Port Macquarie. Port Macquarie was a convicts settlement which began in 1821. The town is now mainly sustained by tourism,fishing and oyster farming. It was here where my new host Kevin Fletcher picked me up from the town centre and took me to his home. At home I met his wife Sheryl and with pasta from the take-away, we had dinner with our feet on the table, watching rugby with a beer. Nothing reminded me off the six hours it took me to get here. This just was all very comfy. And Kevin and Sheryl were overjoyed to meet me as they would never expected me to contact them. But truly they were the only people in Port Macquarie that had invited me. They were fascinated by my project. As soon as Kevin saw the Channel 9-report on TV, he typed in the address on his computer and invited me over. Just for the possibility of it, to help people out with great ideas. Kevin has been a Sydney butcher for years and years, and when there was a little one room shop for sale in Port Macquarie, he immediately decided to buy it. Now he has over 1,000 mothers, as the shop is located in a retirement village with most costumers with an average age of 82-years-old who can't walk that far to a big mall or grocery store. With a few hours a day in the shop, Kevin�s life has improved much more. And he suddenly had more time and fun things to do. He now cycles with a cycling club � every morning � and makes some 300 kilometres (!) per week. Sheryl is a chiropractor-assistant in town and even her life has changed recently. Very recently though, as she lost all her hair last weekend in a charity-event to raise money for leukaemia-research in Australia. There was a big charity fair going on in town where a sponsor would donate 500 dollars for everybody who would cut their hair right there. And without really thinking about it, Sheryl sat down and became this shorthaired as she is today. I was intrigued by the house they lived in, it was not big but so creatively built that it looked like a 27-rooms villa. Kevin told me about their back garden and about their view outside that used to be a rain forest. �If you look out tomorrow, you�ll look at the construction site of a three floors hotel, one metre away from our fence. Such a pity,� he said. But I�d have to see that in daylight.